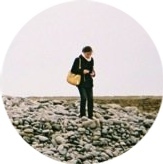 I started this month with the best of intentions, blogging-wise. Then one of my cases went to trial and all those good intentions were scuttled. Whether as a clerk or attorney, trial is probably the most intense of undertakings that a litigation-inclined lawyer ever encounters. It's also increasingly rare in American federal courts (as to both criminal and civil). I've had two trials in my ten months as a clerk, one co-clerk had four, and another co-clerk had zero, but with one coming up. There's been almost no shopping, though I did snag two items on the secondhand market that I had been thinking about for a long time. Because I detest polyester summer clothing, cold shoulders, most sleeve ruffles or flares, and off the shoulder tops and dresses, most of my usual retail stores currently have nothing of interest. J.Crew Factory's been the only place I've seen anything that I'm remotely interested in trying: there's a striped cotton midi skirt very similar to the one I loved last year, though with an elastic waist instead of a zipper, and the linen-cotton sidewalk skirt in fun colors that I might want to try out next month. 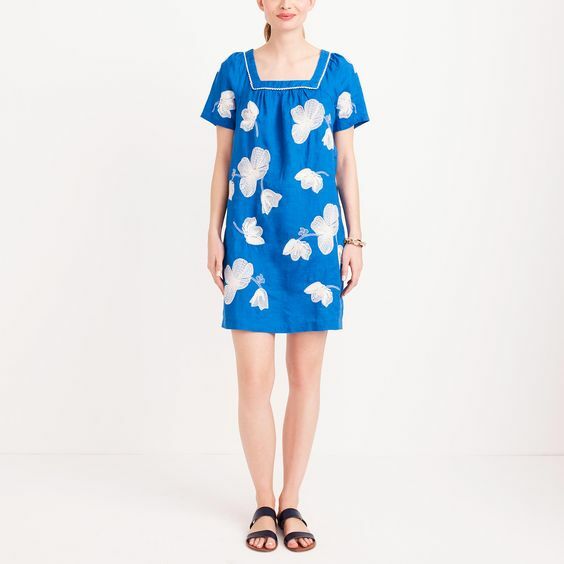 I also find the bright and beachy embroidered linen dress pictured above to be oddly compelling though the shape is outside of my comfort zone. Here are a few other non-shopping things I've been thinking about in the last few hectic months. I sort of resent what I spent on my Fitbit Flex (old version I own here). I'd suspected that fitness trackers are one of those things that's rarely a good idea from a frugality perspective. The simpler ones (still retailing at ~$80) are really just expensive pedometers, as they can't track heart rate and therefore have no hope of tracking calories burned accurately. From reading reviews back when researching the purchase, the entire genre seems prone to breaking down in significantly less than a year of normal use. I'd almost think that one should just get the Apple Watch because it would at least be reliable, have a real warranty, and actually have some real functions in addition to fitness tracking. As for my specific complaints about the Fitbit Flex? It stopped holding a charge well about two months in. The silicone wristband was so badly designed that each one began splitting and soon became unusable within three months. Good replacement bands are hard to find. I have this, but the metal clasps cause heinous contact dermatitis, so I can only use it as a silent alarm clock and keep it on my wrist as little as possible. The irony is that I'm likely getting my money's worth: I needed a reliable silent alarm because I had a year of waking up two and a half hours earlier than K. It seemed clear that the cheaper pillow-shaking or wrist-shaking silent alarms weren't reliable. Cheaper fitness trackers also didn't seem to have a reliable alarm. As a silent alarm clock, in which case the problems aren't as important because I only wear it to sleep, the Fitbit Flex has actually been just fine. I finally went to a branch of the New York Public Library and got myself a library card for access to their e-book collection, which has been fantastic. One of the best-written books I've read since is Paul Kalanithi's When Breath Becomes Air, which is excellent and also incredibly sad. Only somewhat relatedly, as someone prone to thinking about worst case scenarios, I have considerable anxiety about American medical care and well, paying for it. I have no reason to be anxious right now, as a generally healthy young adult with decent (if expensive, but that's never news) employee-sponsored health insurance, but well, I can't help but think that no matter how financially secure I become in the future, after decades of work, a solid bout of serious illness in the family could easily decimate that work within weeks or months. Early on in Kalanithi's book, he spends months with frequent bouts of serious, what sounds like an eight on a scale of ten pain. He, a working doctor, specifically thought of cancer as a possible cause. When he finally saw another doctor, he or she concurred. They didn't end up running a test, and so he wasn't diagnosed then, and the cancer grew. I don't think cost or access was the issue, more his punishing schedule as a neurosurgical resident. Still, cost or access is the issue so often here. I myself have nothing to fear budget-wise or insurance-wise, yet even I still get antsy and drag my feet, worry about receiving a shocking bill in the mail, every time I need to schedule an appointment. I can't help but contrast the American experience with that of extended family in Taiwan (home of one of the cheapest and best health care systems in the world). Last year, there were two cancer scares, each starting with some kind of whole-body preventative, just-because scan (must have included something like a MRI, though I might be wrong) that cost something like $500 USD each. The scan caught, for one person, possible colon cancer that thankfully proved benign after a surgical biopsy and a multi-day hospital stay, and in the other, the earliest stages of breast cancer. Diagnosis and treatment in both cases was easy, swift, and not at all the cause of any financial anxiety. For additional, far less serious, context about the Taiwanese system, I'm not on the national healthcare system, but during a 2011 trip, I had a walk-in visit with a popular dermatologist and got a two-month's supply of name-brand acne prescription medication, all for $15 USD out of pocket. All this is unimaginable here.